HEALTH KARE is modern WordPress Theme, which has been designed specially for Medical Practices, Dentists, Doctors, Surgeons, Hospitals, Health Care Clinics, Paediatrics, Psychiatrist, Stomatology, Chiropractor, Veterinary Clinics and other Medical related Practices. Everything in this product is done with a special care to ensure the quality of this product. This product is an outcome of Our detailed studies and research of making a purpose oriented design and it comes with lot of useful features. It is easy to customize this theme for any of Your website needs. 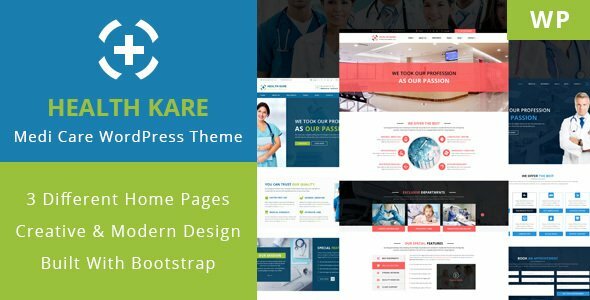 HEALTH KARE theme has everything you need to start your next unique Hospital / Health Care Clinic website!